Lewis Alessandra wants to be a star in League Two and not just shine in pre-season. Hartlepool United’s summer signing from Rochdale has looked as good as anyone in the build-up to the big kick-off. Alessandra has shown no hangover from the frustration of a disappointing 2015-16 campaign. The forward made no impact at Spotland and his season ended with him being relegated from the Football League during a loan spell at York City. But the 27-year-old has looked hungry and sharp in a Pools jersey, none more so than in midweek when he bagged a first-team hat-trick for the first time in nine years. Alessandra showed some clinical finishing with a treble at Guisborough Town, as well as providing an assist for the game’s opener for Billy Paynter. “I’d rather do it in the season,” said Alessandra. “When I was younger, I had a very good pre-season when I scored a lot of goals, but then when the season started I struggled. “But it was nice to score, but that’s what I’m paid to do. “I’m not going to complain. Alessandra’s previous treble saw him score all three Oldham goals in a 3–0 victory over tomorrow’s opponents, Scunthorpe United, back in 2008. The Manchester man will be in the side tomorrow when the Iron come to Victoria Park for the final pre-season friendly. “It’s a more realistic test and that’s no offence to Guisborough. Tuesday was a good exercise for us,” he told SportMail. “Scunthorpe are a good League One outfit with a big budget. You might not quite describe Alessandra as a shoo-in for the League Two opener with Colchester next Saturday. But he looks a pretty good bet, given the energy and link-up play he provides – and a pretty decent finish. “We created a lot of chances and I was pleased to put three away,” he said. “I was helped by some good play – there was a lay-off from Billy’s chest for the first, Kieran [Green] set up my second and Podge [Amond] did great with a little flick around the corner for my last one. “Versatility is one of my strengths – I can play nine, 10, seven, 11, wherever. “I’m a forward-thinking player and I guess that’s one of the reasons the gaffer wanted to bring me in. Alessandra is probably somewhere near the front of a queue for a spot in the starting XI, not just tomorrow, but against Colchester. 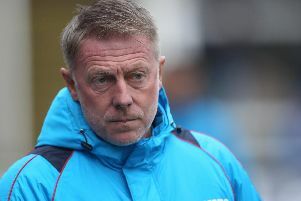 He is part of an intriguing battle to be in Craig Hignett’s first League Two team of the season. Looking at it from the outside, it would seem that there are four players trying to squeeze into three positions, with the midweek scorers at Guisborough – Alessandra, Amond and Paynter – vying with Nathan Thomas, who sat out the friendly action on Tuesday. Competition for players looks keen, bordering on fierce. “I was saying that to Podge,” he said. “We have good players for every position. “I could not begin to tell you our best XI – we have good depth in the squad with a couple of players for each position. Scunthorpe arrive at the Vic in good heart following a 2-1 midweek win over Rotherham, with Kevin van Veen and Josh Morris scoring the goals.